Our master bathroom is finally done!! It was our most complicated DIY project to date, just because we had to move/add some plumbing. We have never attempted that before. It was extremely hard to get a before picture of the bathroom because it was 2 small tight spaces. One was a walkthrough vanity area and the other was the toilet, sink and stall shower. First, we knocked down the wall between the two spaces and relocated the door. We also removed two full size linen closets so we would have enough room to add in a separate tub. We kept the toilet and shower in their previous locations, but added a pedestal tub and second sink. The bathroom is still not huge at 11ftx8ft but we managed to fit everything in and stay within our $7,000 budget. We also added built-ins to the walls between the door to the bedroom so we would have linen storage. Beadboard: PVC from Home Depot. This is on the ceiling as well. It is reversible and comes in two sizes. We used the shorter (3ft), closer spaced beadboard on the walls and the longer (7ft), wider side on the ceiling. Great product to work with. Check out our FAQs page for some more information. 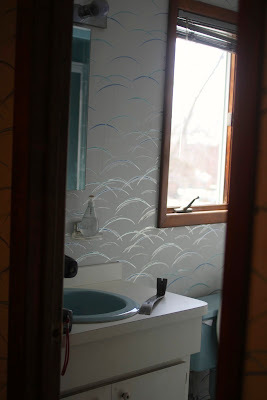 I have also written a post about how about how our bathroom is holding up after 2 years. You can read that here. I hope you found some inspiration here. Thanks for stopping by! GORGEOUS!! You did an amazing job and I love all of your choices. They will stay in style forever. 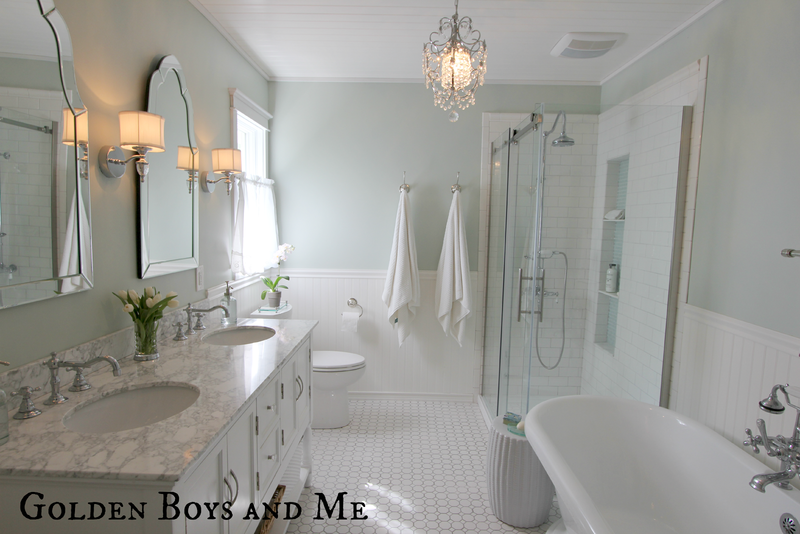 We did an overhaul of our master bath too and know how much of an undertaking it is to move and add plumbing, walls, etc. Doesn't it feel good to accomplish it yourself?! Thanks so much for your comment, Kate! It does feel good to have it done. I am on the way to check out your blog. That's about one of the prettiest bathrooms I've ever seen! Love everything about it. We need to update ours. You have made so many great choices. Love the spa like feel yours has. Thank you, Kelly. We put off updating for a while too, it's a big undertaking! 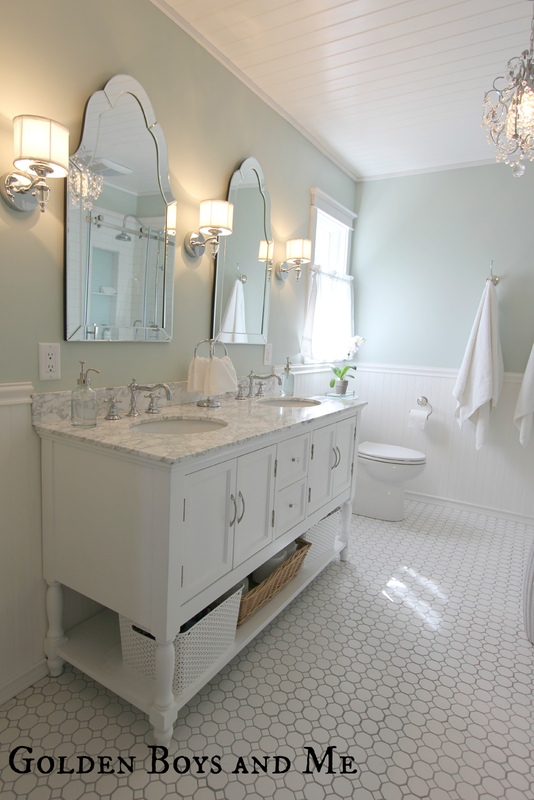 Love, love your bath reno, so tranquil and spa like. Love it, I have been wanting to do the same thing (in almost the same bathroom setup) for the last 8 years. Thanks for posting your new bathroom, it encourages me to get mine done. Thanks for your comment, Pat. I have been thinking about getting this bathroom done for years. So glad it is finally done. Now, if only the master bedroom it is attached to was as update. That is our next project. I dream of moving into that bathroom!! WOW! Thanks, Christine! And thanks for stopping by. Thanks Tammy! I appreciate your comment and you stopping by! just beautiful. every detail is so perfect. Love your new bath, it's gorgeous! Thanks you, Trixie. And thanks for stopping by! That is exactly how I would want my bathroom! 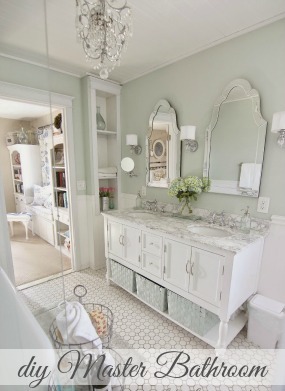 I love the paint color and mirrors! Thanks Melissa. It is a great paint color. Thanks for stopping by! Oh how I envy your bathroom and your DIY skills! I'm frightened to even attempt a bathroom remodel! Enjoy! Thanks so much and thank you for stopping by, Linda! Thanks for the comment and for pinning my bathroom!! Wowza! This is insanely gorgeous. Looks directly out of a magazine. Fabulous job! Thanks Rita. I linked up to your party, thanks for inviting me! How breathtaking! Such a beautiful transformation and I know you must be loving it! Thanks for sharing at Monday Funday! Thanks for visiting and thanks for hosting Monday Funday Trish! Beautiful transformation and you have the tub and look I want. 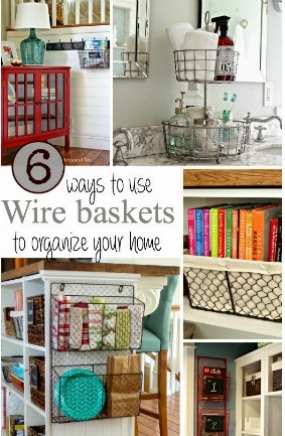 Thanks for sharing at Wow Us Wednesdays and this will be one of the features tonight. Thank you so much, Kim!! This is will be my first time being featured. Very excited!! Gorgeous bathroom Courtney - I have the same tub! I see you have a vacation house in the Adirondacks - I live in North Jersey neighbor. Hi Kelly, Thanks for visiting and for the comment, neighbor! Yes, we love the Adirondacks, have you been there? I am going to check out your blog. Stunning! What a night and day transformation! I'd love for you to come link up this and some of your other projects at my new party! 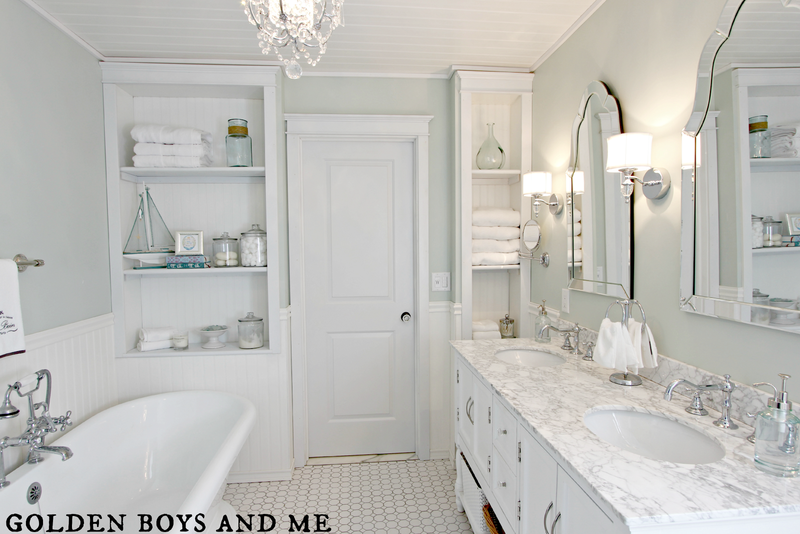 I would love an exact copy for my bathroom! Thanks for all the sources! Your welcome for the sources! Thanks for visiting. I just have to say that I LOVE EVERYTHING about your bathroom ! It is perfect, and you should be proud - amazing job ! Thanks for visiting Patricia! I appreciate your compliments. Wow! What an amazing space you have created. Just beautiful!! Thanks for visiting and commenting Pamela! Beautiful! Looks right out of a magazine! Oh Courtney! I just wanna move right in. And that's exactly the kind of oasis you need after a day with your sweet boys!! Ooh I LOVE it! We are re-doing our master bath right now, and if it turns out as beautifully as yours, I will be a happy, happy girl! I popped over from Beneath My Heart--thanks for sharing! Thanks for visiting and commenting. Good luck with your master bath! Thanks so much for the invite and the comment, Jennifer. I just linked up. Just beautiful. 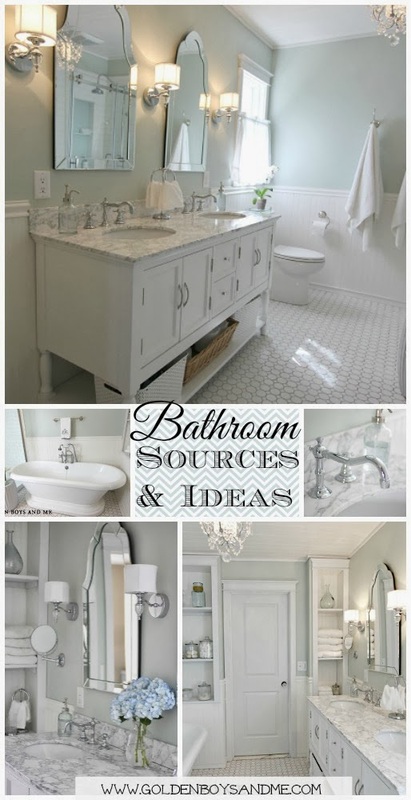 Your bathroom is a dream! Thanks for the compliment and for visiting, Kim! Hi! 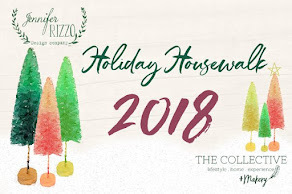 I'm visiting from the Best of the Weekend link party at A Little CLAIREification. You're bathroom caught my eye and I had to come see more. It is beautiful! I love the soft, serene spa like feel. The materials you chose and details you added really bring such elegance and a timeless appeal to the space. Again, the bathroom is just beautiful! Thanks for visiting, Sharon! We were hoping for a spa like feel and I hope it will be timeless. Thank you, Heather! I know what you mean about hating your bathroom. I lived like that for years too. White carpet?? What were they thinking? 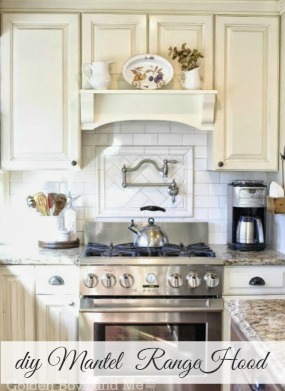 Just think, you will appreciate it all the more when you can remodel. Thanks so much. I am on my way to visit your blog! So so SO beautiful. We ordered the same tub from Vintage - how are you liking yours? Loving the tub. Our first tub came damaged but they quickly shipped us a new one. I think you will like your too :) Enjoy! Oh wow Courtney, your bathroom turned out SO nice! We just did a bathroom reno and used that same mirror. I actually have Sea Salt in our powder room, too. It's a perfect light bluish-greenish-grayish color if I do say so myself :)Great minds, right?!? 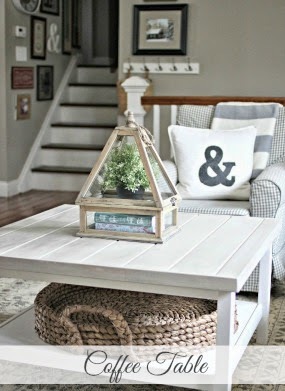 I'd love to feature this on my paint color blog. Let me know if you're interested! Hi Jena. Thanks so much. Isn't that mirror amazing? Adds so much style without a lot of $$. I agree about sea salt. It is a beautiful color that changes with the light depending on the time of day. I would love to be featured on your paint color blog. Thanks so much for asking. 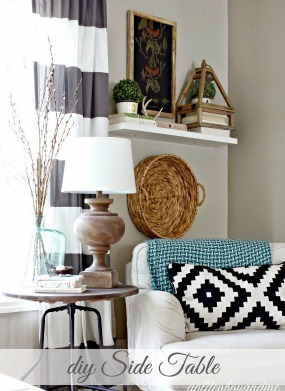 Found you via House of Hepworths - this reno is a total jaw dropper! You have done an amazing job and I LOVE everything! Oh my gosh!!! That is fabulous! It looks so good you should have HGTV calling you and giving you your own show any day now. So love it, and I wish I could copy it right down to the tiniest detail. Well I can a least go get that paint color ;) Great job on a small budget. Thanks Connie! That is an awesome paint color. I had a hard time choosing, but I am so happy with sea salt. This is pretty much my dream bathroom. I am seriously considering stealing the entire look for my bathroom. Definitely checking out those mirrors and floor tile. Thanks for sharing! The mirrors are such a great buy for how much they add to a room. And so is the floor tile :) Good luck with your bathroom. AH-MAZING!!! I'm so in love with this bathroom!!! I want to copy everything! And the price!? You did a fantastic job!!! Love, love, LOVE your bathroom!!! Love your blog too, Courtney! Looking for a chandelier for my bedroom and yours seems to be perfect! Would you share what the product number is on Overstock? Thank you so much! Hi Anne. Thank you! Chandelier is Item #: 12114025 at Overstock. You do have to assemble it yourself but it took me less than an hour and it really is a beautiful chandelier for the money. Hope that helps! Thanks for the idea! I will definitely let you know....I think it will be beautiful in my bedroom! I love it all! I would hang out in the tub for way too long way too often. Your bathroom is incredible! I love every detail from the paint to the lighting! I am following you now. 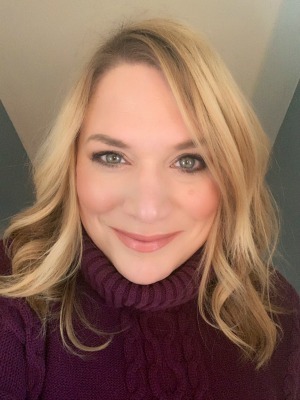 I am a mother of two boys and we have a golden retriever so I think I am really going to enjoy your blog! Sounds like we have a lot in common, Shelley! So glad you are following along. I look forward to getting to know you. WOW! Just stumbled across this via pinterest. Good work - this looks awesome! 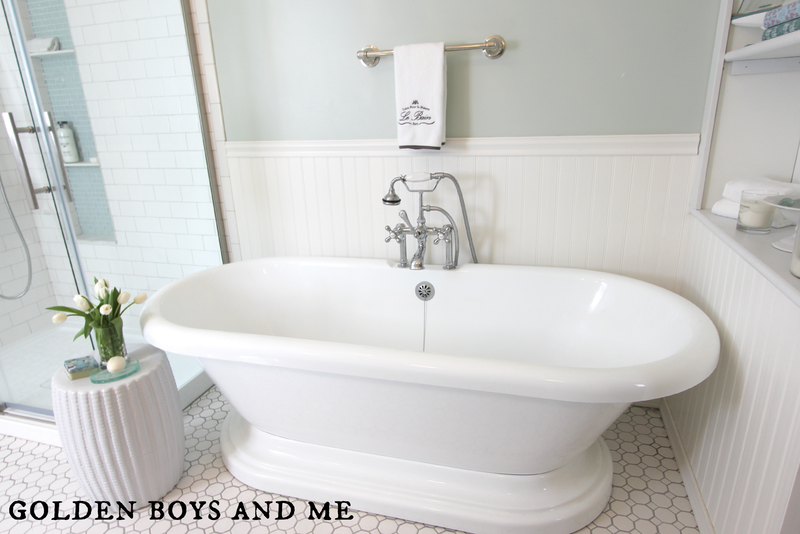 About to embark on a bath reno and love yours. Where did you get those mirrors? Mirrors are Allen and Roth from Lowes. Good luck on your bath reno! Looks brilliant - so smart! Thanks for the invite, Alice! I linked up. You guys did a FABULOUS job!!! 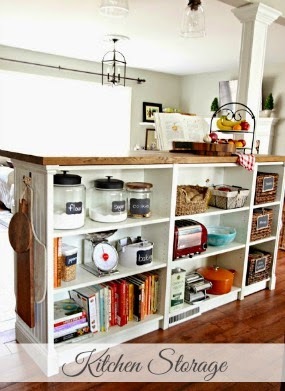 I love all the open shelving you added in around the door and in the shower stall. I also love the white color scheme... It makes the space so fresh and bright! 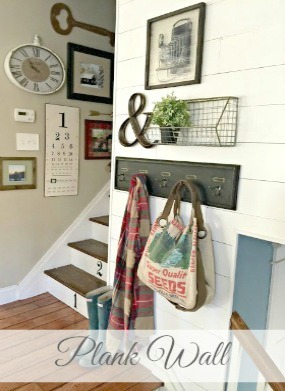 I also love the beadboard ceiling... It's something I wanted to do in our bathroom but am not able to do on my own! Hmmmm....am I the only one having problems with the links to your sources? I keep getting a 404 error when I click?? Thanks for the feature, Alice! That looks so amazing! You did a wonderful job. I am pinning this right now-I love everything and really appreciate you listing all the details too. I'd be thrilled if you could link up this amazing post to my weekly Say G'day Saturday linky party which is on now! Hope you can join in. Your bathroom cannot be more stunning! I love the crisp clean feeling and all the detail you put into it! You are rockin it! I pinned this as inspiration for my dream bathroom. It is so , so pretty!! This is pretty much my dream bathroom. You nailed it! This is absolutely stunning!! Just pinned it. Gorgeous. :-) Well done! Gorgeous bathroom! I love everything you did...this is my dream bathroom! Hi Lisa. The faucets were included with the vanity from Amazon. Hi there. Can you tell me what was used in the shower niches? I found a picture of your bathroom on Pinterest - I just had to tell you how beautiful it is! 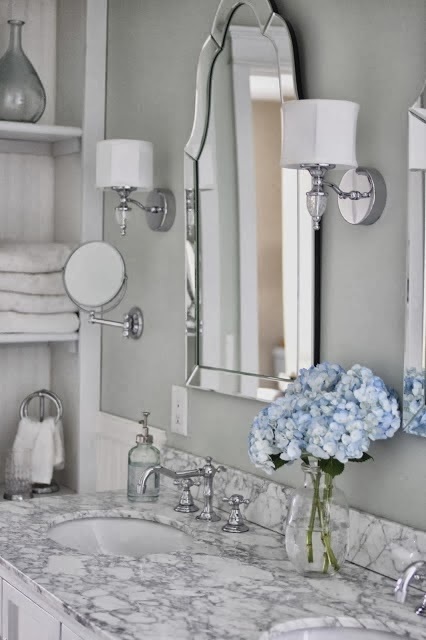 The mirrors are gorgeous - I'm headed to Lowes in hopes of finding them for our own bathroom make over. Beautifully done! I hope you are loving the results of all your hard work. So beautiful! I love the whispers of white! Gorgeous! Beautiful bathroom! Can you tell me the exact name of the floor tile you used from Lowes's and the color grout? I'd like to buy some from my new house. Thank you! Courtney, your bathroom is gorgeous, gorgeous, GORGEOUS! I truly never believed a bathroom could be just so stunning! 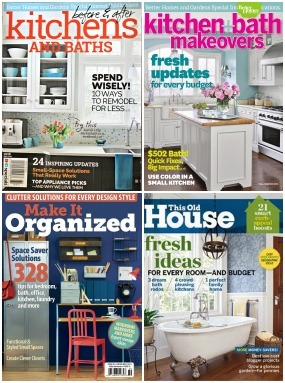 I emailed you awhile back about being featured on Remodelaholic.com (where I work with Cassity scheduling guest features). I haven't heard back, so I just thought I would drop you a line here in case my email got stuck in the spam filter. 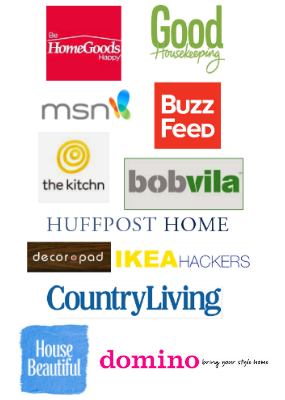 If you're interested in being featured, will you drop me a line at hello@remodelaholic.com? Thanks! Hi. What is the size of your shower and the size of your tub? I am wondering if this layout would work in my space :) Thanks!! Hi Jennifer. Our shower is 48 x 32 and our tub is 71 inches long. Good luck! I loved your basins, the marble and everything... Your bathroom looks so clean and bright and It is a real pleasure having such a bath. Do you have any info on the shower you bought from Costco? Gorgeous bathroom by the way!! HI Shannon. The shower is the Kesey New Waves 48 inch shower online at Costco.com. Love your bathroom. I have tub and faucets sitting in my room now but can't decide on a shower faucet. Are you happy with yours? Can you adjust the head tilt? Is it hard to keep clean? Haha thanks for your help. Thanks! We are very happy with our shower faucet almost 2 years later. 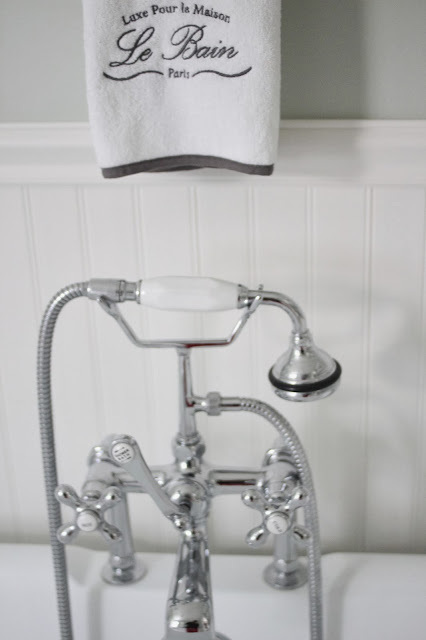 The Kohler head does tilt and it hasn't been hard to keep clean at all. Good luck with your project! I love your bathroom! 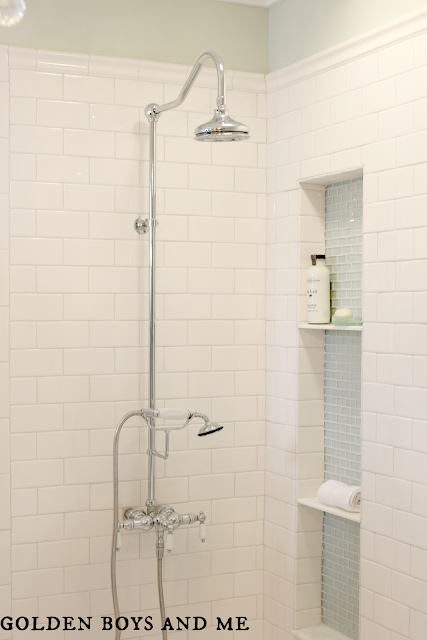 What color grout did you use in your shower and flooring ? Thanks! Thanks! We bought the grout at Lowes and the colors are Delorean Gray for the floor grout and Silverado for the shower grout. Hope that helps! You own my dream bathroom. Seriously it is beyond perfect. WOW, just WOW!!!!!!!!!!!!!! Surveyed the market? Have views today and price with feedback then at last glance towards BEST SHOWERS HEADS.REVIEWS to see the most beneficent among all. Getting confuse with shower heads to select? Best shower heads.reviews brings an outstanding option to select for your bathrooms. Wow. I am absolutely stunned by two things. First, I can't believe how amazingly beautiful you managed to make that space look spending only $7,000. If I was given that same space and budget, I'm not sure I could deliver a COMPLETE and functioning bathroom at all, let alone one that looks like I (easily) spent $25,000 (which, btw, is the minimum amount that anyone who knows what good stuff costs would guess your bath to have cost). So, my hat's off to you for pulling this off! Hi Sam. Thanks so much for your sweet comment! You really made my day. It is fantastic to hear when someone appreciates the work I put into this blog. THANK YOU!! Without a doubt this is the most BEAUTIFUL bathroom ever. The fact that you did the job yourselves is do impressive. We are in the midst of a bathroom reno job and so voila....how fortunate of me to find your site. Congratulations on the bathroom, your blog and all the wonderful inspiration that you have provided. Your bathroom is beautiful. We are purchasing a 1940's home and are taking a secondary bedroom to convert to a master bathroom and closet.Can you tell me the dimensions of your bathroom? It looks to be about the size we are thinking we would like to have. Thank you!! Our bathroom is 12ft by 8 ft. Good luck with your renovation! 1) For the bathroom tile, is it a octagon-and-dot tile design that you have? If so, is it low sheen? 2) Are there any more details you can provide regarding the type of glass tile that was used for the shower niche? I was wondering if you find your shower to be excessively loud. I have read a few reviews on this shower piece, and several of them have complained about the noise from the water flowing through the pipes. Have you had that experience? 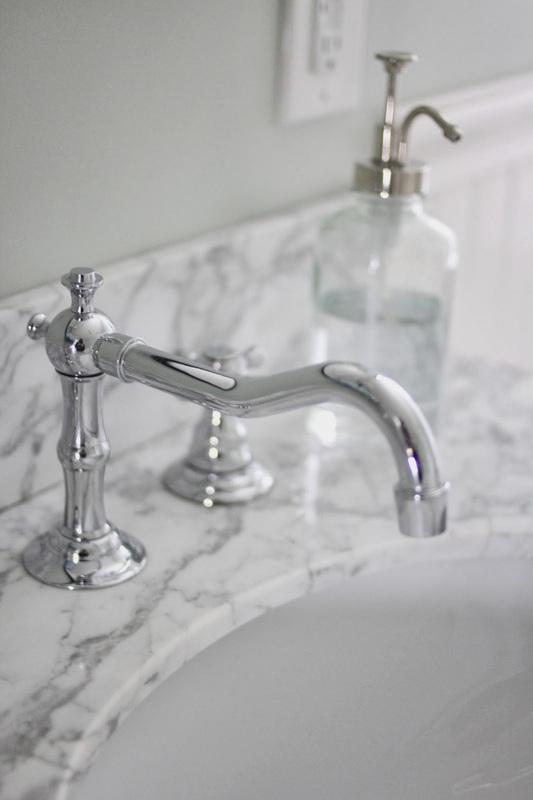 where are your sink faucets from? So glad I found your bathroom makeover on Pinterest! 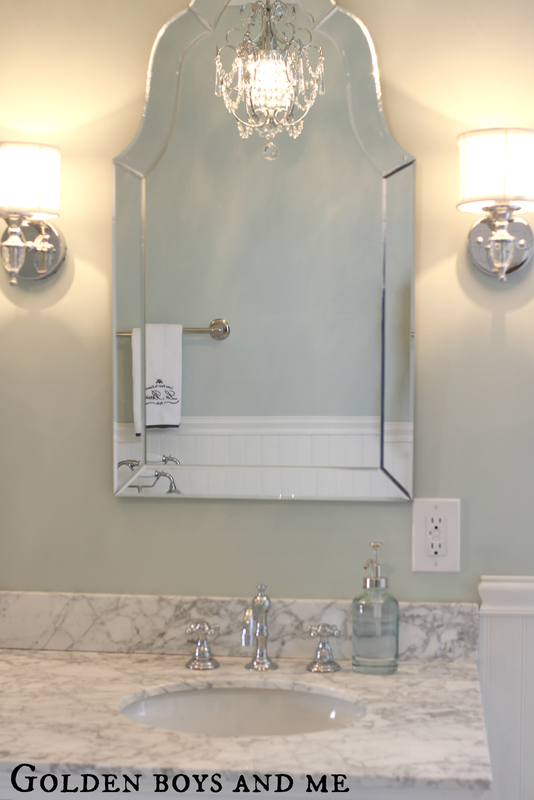 We will be purchasing the same mirrors and possibly use the same paint color too. 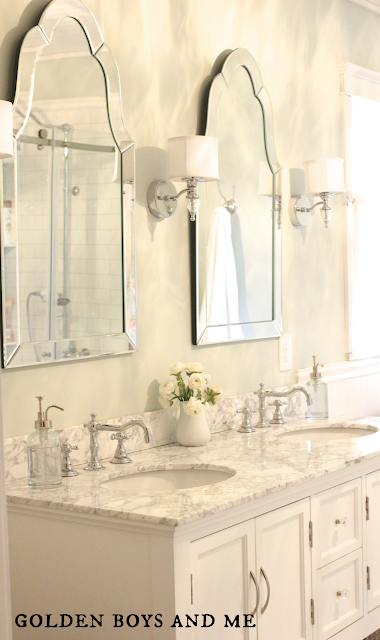 Our goal was to make our bathroom feel like a spa - and you nailed it! Hi! Beautiful work!! I noticed that you mention that your shower unit was from Costco. Would you mind sharing a link or name if they still carry it. Sorry if I missed this and you already shared that info. Thanks!! Really this bathroom is looking so gorgeous. I appreciate your choice. Also your budget was perfect. Every homeowner with a basement imagines that horror. If it should happen to you, don’t retreat into a fetal position on your couch and hope for a miracle, no matter how much you want to. You can deal with the soggy disaster. Here’s how. Beautiful. Did you have popcorn ceiling before and did you have to scrape down the popcorn before applying the bead board? i love your bathroom. i just give detail about my bathroom on blog best shower heads HQ site. Please take a look.